Making a lasagna does not have to take hours of preparation – the key is just planning and preparation. This recipe took me 51 minutes to get in the oven. And factor into this 51 minutes that I was making this recipe up as I went and taking notes, I had to go out to the garden for the herbs, and I ended up battling a Tomato Horn Worm that would not come off my plant for me to flush (he won – I got too freaked out). So Keep Calm and Make Lasagna. Put a large pot of water to boil. Preheat oven to 425F. In a large nonstick skillet over high heat, melt 2 T butter. Add the mushrooms and brown. For more in-depth instruction see my How to Brown Mushrooms article. Move browned mushrooms to a plate and set aside. In the same skillet over medium-high heat, brown the sausage breaking the meat up into small bits as it cooks. Once browned and no longer pink, move the sausage to a bowl lined with 2 layers of paper towels to drain the fat. Set aside. Layer the diced zucchini on a rimmed baking sheet. Sprinkle with 1/2 t salt and drizzle 1 T olive oil. Toss to coat the zucchini. Roast in the oven at 425F ~8-10 minutes until just softened and a touch browned, but not completely roasted. Remove from the oven and set aside. To make the bechamel, heat a medium saucepan on medium-high heat. Add the remaining 2T butter and the flour. Cook, stirring regularly, 4-5 minutes to make a roux. Whisking continually, add the milk. Cook, stirring, 5 minutes until very slightly thickened. Add 1 t salt and a pinch pepper and set aside. 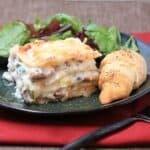 In a medium mixing bowl, combine the ricotta, 1 t salt, the herbs, and 1/4 c of the prepared bechamel (I always add a little bechamel to the ricotta in any lasagna - makes it creamier and easier to spread). Cook the lasagna noodles according to package directions in heavily salted water. Drain and rinse briefly with cold water to prevent noodles from sticking to each other. 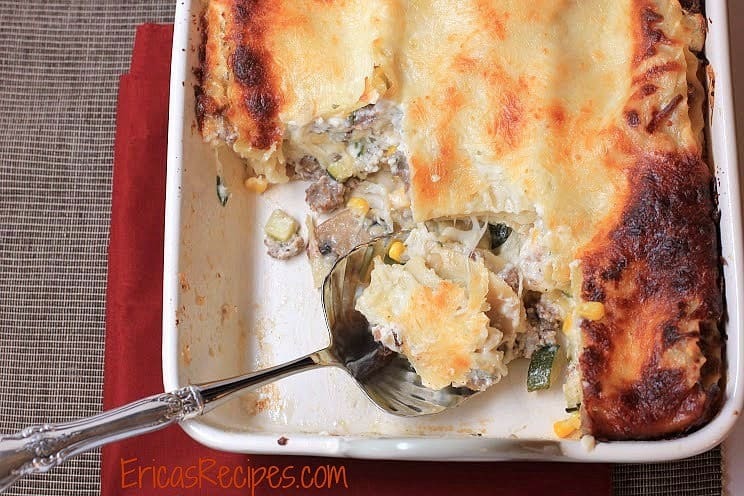 In a lasagna pan or other deep baking dish sprayed with cooking spray, spread 1/4 c bechamel. To the remaining bechamel in the saucepan add the sausage and stir. In the lasagna dish over the bechamel, layer 3 lasagna noodles, trimming if necessary to fit. 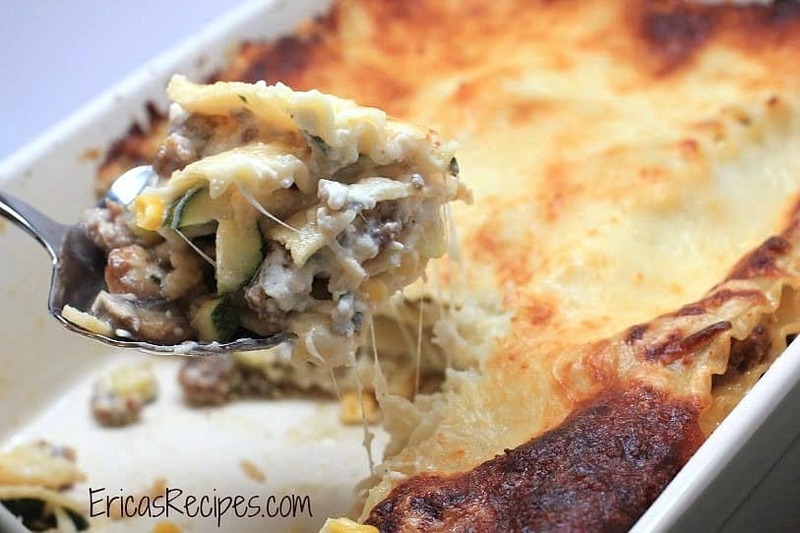 Layer half each of the mushrooms, corn, and zucchini. Layer 1/2 c fontina, 1/4 c parmesan, and 1 c mozzarella. Layer 3 more noodles. 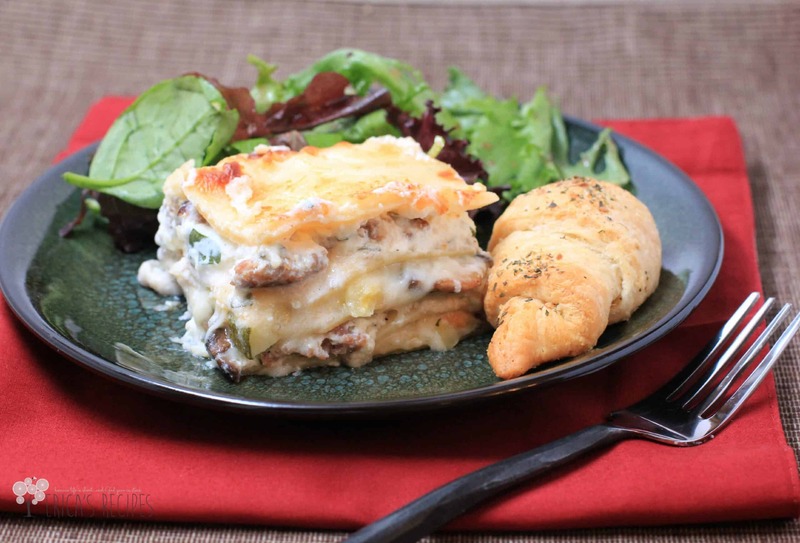 For the second layer, spread half the sausage-bechamel mixture and half the ricotta-herb mixture. Layer another 3 noodles. 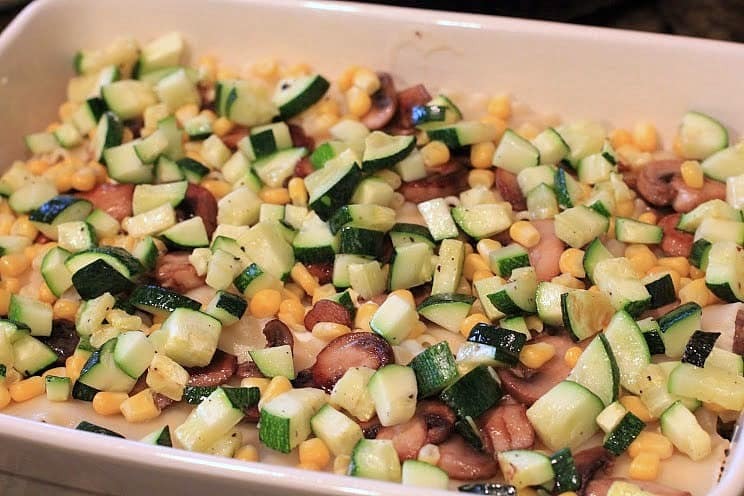 Layer the remaining mushrooms, corn, and zucchini. Layer 1/2 c fontina, 1/4 c parmesan, and 1 c mozzarella. Layer 3 noodles. 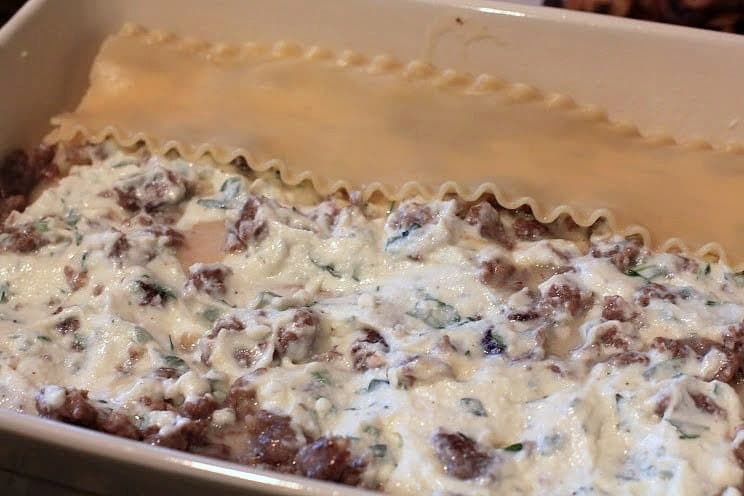 Layer the rest of the sausage-bechamel and rest of the ricotta-herb mixture. Layer the last 3 noodles (I had to press everything down pretty well by this point to get it to fit). Top with 1/2 c fontina, 1/4 c parmesan, and 2 cups mozzarella. Bake at 350F for an hour. 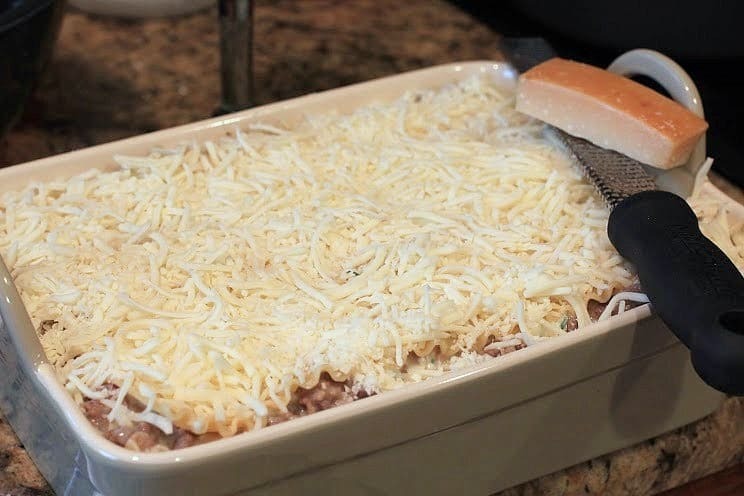 The cheese on top will brown before the lasagna is cooked all the way through, so once it browns (~30 minutes into the cooking time), top with foil. 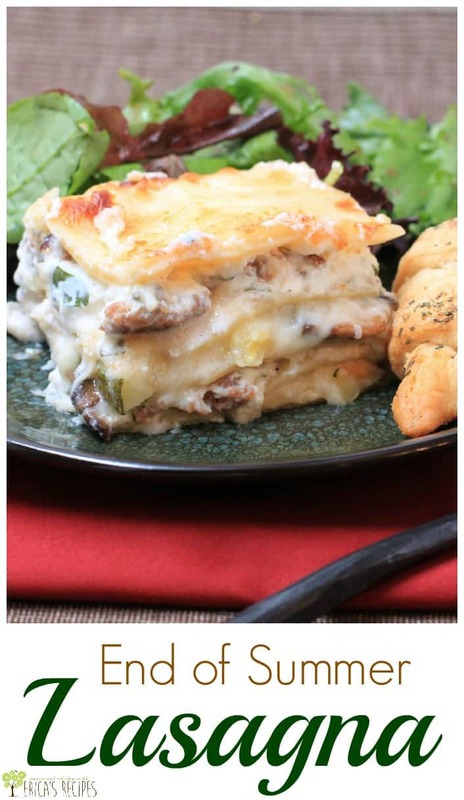 Remove from the oven and let lasagna set 15 minutes before cutting to serve. Serves a crowd (~8-12) - after all, it's lasagna!